National University of Science and Technology NUST is top rated engineering university of Pakistan. NUST admission procedure through NET is very easy, almost everything is done online we will discuss steps later in this blog. NUST is rapidly growing and providing quality education to their students. NUST was established in 1991, they have many campuses in different cities but their main campus is in Islamabad. NUST NET – I is expected to be conducted in Dec 2018. Entry test conduct in Islamabad is going to be computerized. NUST entry test is one of the hardest engineering test, thousands of students from all over Pakistan apply for this test in order to get admission in top engineering University. Many people will fail due to lack of practice and time management, every single applicant who is willing to secure admission should give his 100%. 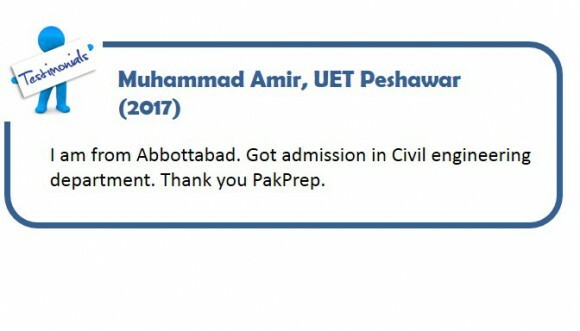 Pakprep.com provides full solution for every student who is willing to secure seat in NUST. 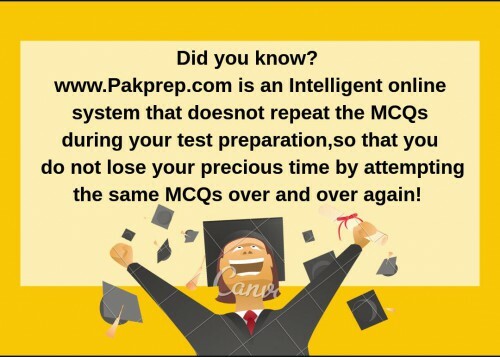 Pakprep.com have more than 15000 solved MCQ’s along with explanation, past papers, MOCK test and smart analytics. By using our website you have many advantages over other students, our system will show you your performance graph separated chapter wise. MOCK test will help you in managing your time in a better way than the others. Smart analytics will also keep a separate log of all your mistakes so that you can go through them just before entry test and don’t repeat them in paper. To start your preparation today with pakprep.com please CLICK HERE. Visit https://ugadmissions.nust.edu.pkand get registered by providing valid e-mail address. Candidate will be allotted a login ID and password to access the online application form. Fill the online form, upload recent passport size photograph (with plain background), and submit the form. Successful submission of form will be confirmed through an e-mail by NUST. Re-Login to your account and print Fee Invoice for depositing processing fee from My Account page. Candidates can deposit fee with any branch of HBL. Fee deposit will be verified through e-mail within 5 days of payment. Candidates of computer based test will have to choose Test Date and Session out of the available options. Allocation of Test Date and Session will be made on ‘First Come First Served’ basis. Candidates of computer based test will be allocated Roll Number, Test Center, Test Session, Log-in ID and Password. For Paper Based Test at Karachi and Quetta in April and July, candidates will be informed through email regarding printing of Admit Card containing exact time and center for Entry Test. Candidates are required to print their Admit Cards and bring the same to the Test Center along with original CNIC or a document with Photo ID such as Passport, original Metric / HSSC certificate, etc. Candidates can appear more than once to improve their score. Best score will be picked by the system for merit generation. Candidates can review their preference of choices after announcement of merit list. No application for change of preferences will be entertained thereafter. Candidates will be required to confirm whether they want to stay in the allotted programe or would like to be considered for up-gradation. The seats becoming available as a result of drop-outs will be re-allocated and filled through the up-gradation of candidates who have confirmed their willingness by depositing admission dues in time. Candidates failing to deposit admission dues within the given time will not be considered for admission any further. Admit Cards will be retained at the Test Centers for further verification. This entry was posted in NUST and tagged Best way to prepare for NUST, Best website to prepare for NET-I, Best website to prepare for NUST, Best website to prepare for NUST NET-I, Download NUST NET Past Paper, Download NUST Past Papers, How much marks I need in NUST NET?, How to Calculate NUST Aggregate, How to prepare for NUST, How to Prepare for NUST NET 2016, How to Prepare for NUST NET 2017, How to prepare for NUST NET-I, How to prepare NUST NET, How to Register for NUST NET Test, How to register how nust net, Important Maths Topics for NUST NET, Important Physics Topics NUST NET, Marks Required in NUST NET?, NET, NET 1, NET 2, NET 3, NET admission procedure, NET-I explained MCQ’s, NET-I MCQ’s, NET-I MOCK test, NET-I past papers, NET-I solved MCQ’s, NUST, nust 2015, nust 2016, nust 2017, nust admission, nust admission 2017, nust admission procedure, NUST admission procedure through NET, Nust Admission Test, Nust Admission Test 2015, Nust Admission Test 2015 engineering, Nust Admission Test 2016, Nust Admission Test 2016 engineering, Nust Admission Test 2016 NUST NET 2016 Preparation, Nust Admission Test 2017, Nust Admission Test 2017 engineering, Nust Admission Test 2017 NUST NET 2017 Preparation, NUST Aggregate, NUST aggregate 2014, nust Aggregate 2016, nust Aggregate 2017, NUST Biology MCQs, Nust Chemistry MCQs, NUST Eligibility Criteria, nust engineering, NUST Engineering Past Paper, Nust Entrance Test, Nust Entrance Test 2015, Nust Entrance Test 2016, Nust Entrance Test 2017, nust entry test, NUST Entry test 2015 preparation, NUST Entry test 2016 preparation, NUST Entry test 2017 preparation, NUST entry test expected dates, NUST entry test expected dates 2018, nust entry test preparation, NUST explained MCQ’s, NUST FEE Structure, nust financial aid, NUST Integration MCQs, Nust Islamabad, NUST Maths MCQs, nust mcqs, NUST Merit 2014, nust merit list, NUST merit list 2016, NUST MOCK test, NUST Mock Tests, nust net, NUST NET 1, NUST NET 1Paper Pattern, NUST NET 2, NUST NET 2017, NUST NET 2017 Format, NUST NET 2017 MCQs, NUST NET 2017 Physics MCQs, NUST NET 3, NUST NET 3 Preparation Online, NUST NET 3 Solution, NUST NET admission procedure, NUST NET Biology MCQs, NUST NET Chemistry MCQs, NUST NET Maths MCQs, NUST NET Online Preparation, NUST NET Online Test Preparation, NUST NET Paper Pattern, NUST NET Past Papers, NUST NET Physics MCQs, NUST NET Practice Test, nust net preparation, NUST NET preparation 2016, NUST NET preparation 2017, NUST NET result, NUST NET-I, NUST NET-I eligibility criteria, NUST NET-I entry test, NUST NET-I expected dates, NUST NET-I explained MCQ’s, NUST NET-I MCQ’s, NUST NET-I MOCK test, NUST NET-I past papers, NUST NET-I solved MCQ’s, Nust past paper, NUST Past Papers, NUST Past Papers Engineering, NUST Past Papers Medical, nust physics, Nust Physics MCQs, Nust Practice MCQs, Nust practice test, nust programs, nust scholarships, NUST Semester FEE, NUST Solved MCQs, Nust test, nust undergraduate, nust undergraduate admission, nust undergraduate admissions, nust undergraduate program, nust undergraduate programs, NUST University, online NET-I preparation, online NUST NET-I preparation, online NUST preparation, Sample NET questions, Sample NET-I Chemistry questions, Sample NET-I Math questions, Sample NET-I Physics questions, Sample NUST Chemistry questions, Sample NUST Math questions, Sample NUST NET-I Chemistry questions, Sample NUST NET-I Math questions, Sample NUST NET-I Physics questions, Sample NUST Physics questions, sample NUST questions, Solved NUST MCQs, Solved NUST Past Paper, Where to prepare, Where to prepare for NET-I, Where to prepare for NUST, Where to prepare for NUST NET-I, Where to prepare for NUST NET-I entry test on November 5, 2018 by Pakprep.com Admin.